Michał: “We were at full throttle for most of 2017. There were good periods and periods when we felt we were beating our heads against a wall. We had to gain a lot of new knowledge and skills. Expectations grew. We changed, improved and invented many elements. Finally, though, all the planned mechanisms are implemented. Sandbox works, macro-management too. You can fight the enemy in various ways. The U-boat is filled with details. Crews live and work. It’s been exhausting, but when we were putting together the last movie and watching the effects, we finally saw how massive and detailed Uboat is and we were very proud. Major changes to the Unity engine added to the workload too. While we are very happy with the improved looks and performance, it was a major challenge to constantly update a project of Uboat’s scope. It's nice to be back here with a regular update again. Furthermore, the time to sum up a whole year has come. The last period was the same as usual a hard-working, it's probably our lifestyle already ;) We tried to do as much as possible to get to the moment that we will only be refining the details. Do not count your chickens before they hatch, but we think we have implemented all we planned. The last ones were shooting, implementing types of ammunition, more precise damage mechanisms and macro management. We tried to refine all elements as accurately as we were able to. We were watching other productions, collecting materials, reading them, watching them, trying to draw the right conclusions. Have we succeeded? You will judge. Not everything is closed, it must wait for its time and constantly evolve together with our knowledge. In the new year we will mainly polish the game, add more ships, graphics, sounds, voices, texts, icons and other minor elements. Furthermore, we will be involved in the production of the campaign. That's real final part. But now let's get to the summary of recent works. We've fully implemented both manual and automatic modes for all types of guns on the boat. All guns have different types of available ammunition that we tried to model in a historically accurate way. Food: bread, meats, vegetables etc. Mission equipment: hand guns, weather stations, deep diving suits etc. It's now possible to rescue and capture enemy pilots or crew in addition to arresting your crew mates for their misbehaviours. You can either keep the prisoners under guard in Battery Room No. 1 or let them freely roam your boat. You can drop your prisoners in ports for some budget and prestige points. We've introduced numerous improvements to our damage system in this update. - Most enemy vessels can now be broken in half, if they are badly damaged into a weak spots on their hulls. - Hull holes are now fully 3D and reveal ship's internal structure. - Water gushes from explosions were made from the scratch again to follow your feedback. They are far better than they used to be. - Torpedo fuzes were fixed back again. You won't be able to damage targets in a close proximity to your ship. This is a major change for the gameplay and it's rather a good one. From now on all officers on your boat, including a skipper, can be promoted to field officer ranks (Stabsoffizier) and work at Kriegsmarine headquarters. You will get your first field officer after finishing the first story mission and can gain more of them by spending prestige points. You can communicate with the headquarters by using onboard radio as long as you are in your currently built transmitters range. After establishing a communication you can assign jobs to your men out there. - They can start and oversee missions for your u-boat. It's now the only way to start missions in the game as this explains well how you are free to choose missions for yourself. - They may work on tasks directly supporting your war effort in addition to providing something useful for your boat. This includes building new submarine pens, decrypting enemy codes, researching new technologies etc. In addition to your field officers there is also the rest of the admiralty represented by Admiral Dönitz. Admiralty chooses work for themselves independently from you and they push forward historical evolution of the world independently from your added impact (which is configurable to satisfy pure simulationists too). Ship physics were criticized in your feedback to the last update and we tried to do something about that. As of now, our physics system for ships has been completely rewritten and uses neural networks to approximate many factors that normally were too expensive to compute or would require too much toying around with simplified colliders. In addition to more realistic boat visual behaviour, this new method has a better performance and ensures historically accurate diving and acceleration times. This means that from now on it's no longer that easy for your enemies to dodge torpedoes, so even if they spot you or your torpedo it's often too late for them to do anything with this. Not all our ships use updated physics, so on the video you can be sure to see it in action just on the u-boat. Also, it's very tweakable so if you don't like something about it, we will probably be able to fix this. As a matter of fact we recorded hours of footage with different settings and made a voting in our team to choose a preset that looks most convincing in our opinion. Our radio communications were massively upgraded. After selecting one of your radio operators you will see a list of transmissions reaching your boat. Usually these last for a limited time, so you have to hurry, if you want to receive them. Some transmissions are encoded, some are not. If it's not Enigma nor a broken Allied code then at best you will be able just to track its location with a direction finder. In addition to messages, radio can now be used to communicate with your headquarters and to listen to radio stations from many cities around the world to boost morale recovery. Aircrafts in our game are now fully functional although we still don't have final models for them ;) Planes should approach your boat realistically and drop their bombs with a correct horizontal acceleration. Sometimes they may flood their engines, if they get too close to water when dropping bombs. It's intentional and not a bug as this was happening historically at times and we tried to model this in our game too. Besides all of these additions to the game we were mostly working on fixes and necessary improvements to existing stuff that felt raw and that probably took us most time since the last update. This trend will now continue and we (probably?) won't add anything new to the game from now on and focus on fixing stuff. Having this in mind, it's probably our last big content update, but you will hear from us more as we will be sure to keep you updated. We don't feel confident enough to give you any reasonably accurate estimate how much time this remaining work is going to take, so for now we will still have to stick to the "2018" release date. We feel that it's good for all of us as with our relatively small team size, we can't reliably predict how much time this work is going to take. Usually there is just one unreplaceable person for each task and if delays happen it's just how it is. PS many thanks for the feedback since the last update. If you feel that we should improve some area of the game feel free to speak openly in the comments section as we literally read all comments. We are aware of some things that need to be improved, but we lack the perspective and distance that only you can put into our further considerations. Thanks! We hope that you had a great holiday. The game is getting more and more full of shape. As usual, we changed some old things that seemed to be good before, but in time with our experience increasing they had to evolve into better form. We have also added quite new things that we hope will appeal to you. You must be impatient, so let's get to the point. We've expanded our upgrades list with 5 conning towers. These are shipped with extra AA guns at no charge. In our quest to let the player manually control as many devices on the boat as possible (if he wants to), we've implemented manual hydrophone in Uboat. It's a pretty realistic implementation that allows for adjusting the listening frequency and accounts for the variable sound frequency diffusion in the water. Along with the hydrophone, we had to upgrade the audio system in Uboat to make distant sounds be more realistic and behave correctly under water. That adds extra immersion and it was necessary to make the hydrophone right. We now have a fully animated torpedo maintenance and loading. Woohoo! That was a pretty complex process to animate. Depth steers both manual by rotating the wheel and automatic. Relax animations: sleeping, reading magazines, smoking, playing cards etc. Observation animations using the binoculars. It's a bug or feature.. I really don't know! WW2 subsim games are all about sneaking and hiding and our detection mechanics had to evolve appropriately. From now on there are 7 detection mechanisms: visual, passive sound, active sound, radar, radar detector, radio and information (from HQ or other allies). Most of them can be either direct or indirect. Indirect detection in Uboat means that specific objects in group cannot be distinguished. Your crew may spot a smoke at the horizon or just hear some distant group on the hydrophone. What you know is that there is a group of something out there and depending on the detection method you may know, if these are ships or airplanes, estimate the size of the group, its position and even speed. Smoke screens, regular smoke from fires, fogs and physical objects block the line of sight. Detonated depth charges, shadow zones, seabed proximity, physical objects and stealthy hull covers affect sonar detection. Devices on the ship, shadow zones, propeller cavitation and surface proximity affect hydrophone detection. Radio transmissions make all destroyers go in your direction. Weird. Most factors can be quickly reviewed in a detection notification tooltip. As you can see now there are many factors for tactical minds to consider. Meters around the boat had been massively improved to be historically accurate, easily readable and to have a high resolution textures. Friendly member of our community has kindly photographed for us U-995 meters from up close, so we will probably improve them a bit further, if there is something wrong. We've started scripting these meters to make them indicate correct values. This process will probably be finished for our next update. From now on you can spot living crew on other ships too. In case of danger they evacuate the ship on pontoons. That's still an early work in progress, but you can see it on the video. To make the crew more lively and convincing we've implemented screen-space subsurface scattering into Uboat. It's a technique that tries to simulate the realistic light propagation in human skin. We did our best to keep the implementation fast and reasonable as many SSS techniques are widely known performance killers. If one would compare our newest video with any of the older ones, we're sure that the atmospheric effects improvement will be very apparent. Previously we've been using single ray scattering, but now we've implemented approximate multiple scattering. It improves the look of horizon, distant objects and fogs. We felt that it's important for a game like this as the camera is always in the open space. Notice that parts of the image covered by fog become blurry. It's a work in progress actually as our animals have their models and animations in production, but you can hear them on the hydrophone. We've used actual recordings kindly supplied by NOAA to make our underwater environment sound convincing. It adds a lot to the immersion when you pick these little guys on the hydrophone too, not just the propellers. Also.. swimming among them may help you stay undetected. Besides that, icebergs are now generated in areas with cold climate. They may hide your boat or your enemies from the view and provide tactical advantage. Our talented 3D artists are now working on a second batch of ship models. You can expect to see the results in the next update. This time some freighters are going to join the party as currently we're still having just the Liberty in the game. You can see them in our new video. Let us know, if they are okay. Note: new, tweaked bow waves can be seen only on the Flower corvette near the end of the video. Previously only our attack periscope was manually useable. 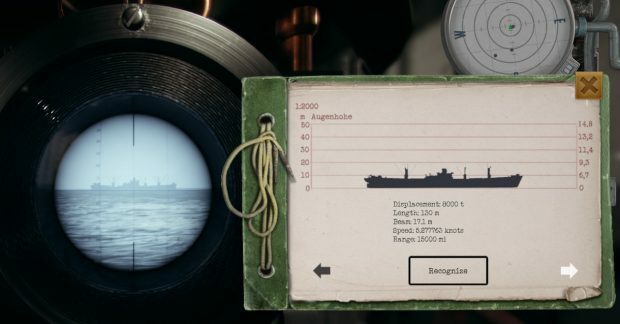 From now on also observation periscope and targeting sight on the conning tower can be used by the player. Hulls of non playable ships are now composed of compartments too that are sealed by the crew when needed. Internally it's not a visual element, but math thing. It's resultant effect is that ships now don't just sink vertically, but as their center of mass changes from the flooding water they may also rotate in many different ways like it's commonly seen on WW2 sinking ship photos. That also makes some parts of the ship more vulnerable than the others. We've also added other improvements to our damage system like secondary explosions from torpedoes stored on the deck etc. Diseases now spread among your crew, especially in cold regions. It's a good idea to take antibiotics on the northern trips. 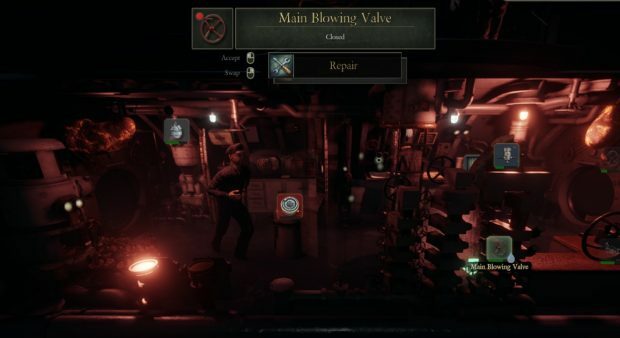 We are progressing further on our quest to add interesting long term gameplay elements into Uboat. We always had an idea what we want, but still it's something new to the WW2 subsim genre and definitely requires taking one step at a time.. but we are getting there! As many of you have pointed out, turning the wages of war seems like a great addition to the game and gives the player actual goals to pursue, but it's also pretty tricky when it comes to realism as you control just a single boat. We did our best to make it convincing and let the player choose the degree of this impact, but it still felt like half-measures. We are currently working on a system of promoting your officers, including skippers, to the HQ. That's something that was happening in the history pretty often and that lets us expand player's reach. Only trained and experienced officers can take such path in their career. When they go to HQ they are still your people and you can assign them projects to work on. It's like a tech tree - using their influences they may support researching new technologies for the Kriegsmarine or Luftwaffe, complete engineering projects like the Goliath transmitter and support undergoing military operations. We would love to hear some feedback about this as we are getting many great ideas from your comments. Kind thank you upfront! We are not maniacal perfectionists and would really like to give that baby to the community as soon as possible, if for nothing else, just to earn something on our hard work. 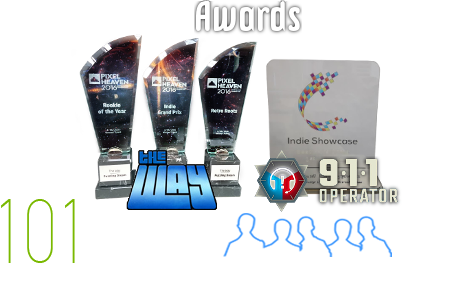 Our goal though is to make a good game that will stay around for years and we are still not at this point. Process to get there doesn't let us release a small game and expand it into a big thing - there aren't many cases like this in the gaming history. 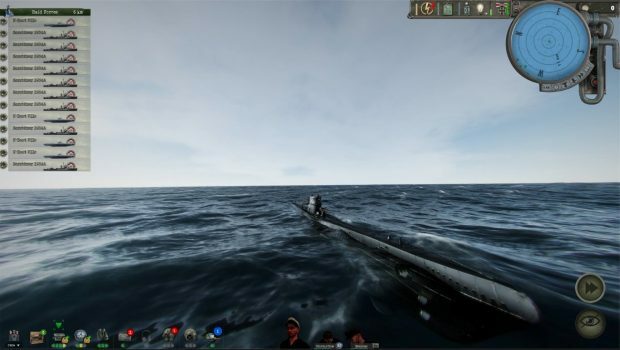 In its current shape Uboat is still not playable due to our far reaching design decisions. There are still lots of missing assets like animations, voices, icons and there are missing gameplay features too. Some of them are pretty basic stuff like AA guns not working and having just the Liberty to hunt on, while other are pretty complex issues to resolve. There aren't any big risks for the production on the road, but we will have to test your patience. 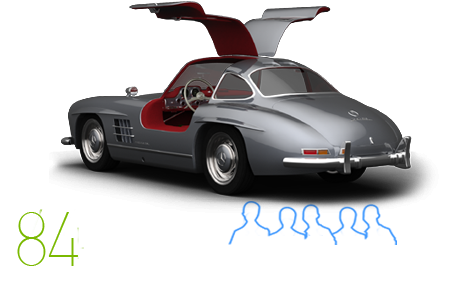 We are very thankful for your investment in our project and we keep doing what we believe is the best option to make Uboat a successful project. We definitely won't make it in 2017 and will keep you updated with each update how our progress is shaping. We still don't declare any specific date for many good reasons, but you can be sure that the release is going to happen as soon as that will be possible. As you can see, we are working very hard to make that happen and present many exciting additions to the game with each update.